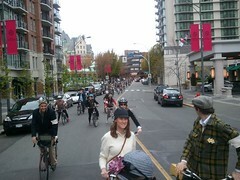 Posted on September 20, 2013 by Tweed Ride Victoria Posted in Uncategorized	. In Victoria, what says Tweed, nay, what veritably shouts Tweed, more than our very own W&J Wilson Limited. In the same location since 1862 on Government Street, W&J Wilson have sponsored us to the hilt from the very start. And this year is no exception! And as in past years, Tom Thompson, owner of the Shop will be judging the Best Dressed Gentleman and Best Dressed Lady of the Ride. W&J Wilson is the official merchant of Harris Tweed of Scotland in Victoria. And this year, as in last, the Best Dressed Gentleman will receive an authentic Harris Tweed Jacket, handsomely donated directly from Harris Tweed in Scotland. And, also from W&J Wilson, the Best Dressed Lady will receive an all-wool tartan scarf from Johnstons of Elgin. What could be a Finer Prize for such a Fine Effort? 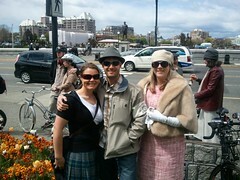 Posted on September 18, 2013 by Tweed Ride Victoria Posted in Uncategorized	. We have a a few treats left to intrigue and temp you with yet….here is one: Our Destination – The Japanese Garden at The Gorge. Did you know that it was the 1st Japanese Garden in North America? Did you know that its designer was the same chap who designed Butchart Gardens? “In 1907, Japanese garden designer Isaburo Kishida, then in his 60s, was asked by his son, Yoshitaro, to take the long and difficult sea journey to Victoria B.C. and join him in setting up a Japanese tea garden in Victorias Esquimalt Gorge Park. It was the first Japanese gardens in British Columbia and it soon started a trend of them amongst Edwardian high society. In the 1920′s and 30′s, Victoria’s Gorge Waterway was the place to be in the summer. Along with swimming and boating, one of the most popular attractions was the Japanese Tea Gardens. The Garden was operated until 1941, when the Takada family who ran it, were sent to a Japanese internment camp in the Kootenays – never to return. The Gardens and Tea House were destroyed by vandals. The Township of Esquimalt and Volunteers have done Yeoman’s work in restoring the site. So, we offer up a bit of our local history to the Riders and hope that they enjoy the Kishida-Takata Gardens while on the picnic. 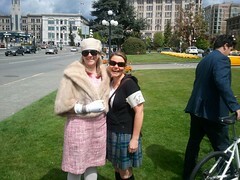 Posted on September 15, 2013 by Tweed Ride Victoria Posted in Uncategorized	. The Pedaler, our local Champions of the Bicycle Tour, have Most Kindly consented to be the judges and Sponsors of this year’s newest Competition – Tweediest Couple! We have noticed, in previous delightful Rides, how many couples enjoy the pleasure of one another’s company so much that they inspire one another the higher levels of Tweed. To recognize this occurance, The Pedaler will be putting a critical eye of observed couples to see if they achieve the Standard and win the covetted prize, a culinary tour for two. What makes the Tweediest couple, you ask? Perhaps it is the cut of ones jib? Or the way one walks arm in arm? Or the tilt of a Newsboy? 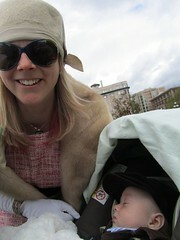 Or the way that Tartan shawl accentuates the cloche you are wearing? The Genius is in the Details, what? 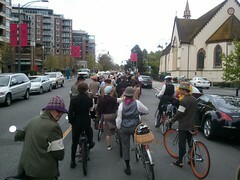 Posted on September 14, 2013 by Tweed Ride Victoria Posted in Uncategorized	. This is the second of four weekly notices updating Riders on this week’s events and information. 1. 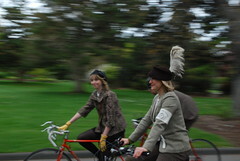 We are delighted that we can now announce the Official Tweed Ride Route. Click here to see map of Route. 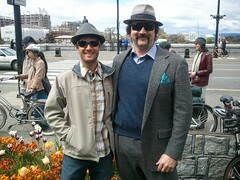 12:50 pm – Tweed Ride and Blue Bridge – the one and only time that Tweed Ride will get to ride over that wonderful span before it is demolished. We then swing onto the Galloping Goose Trail. Be aware that as the Trail narrows, we will be asking Riders to shift from Columns of Fours down to Three’s, Twos and at one point Ones. 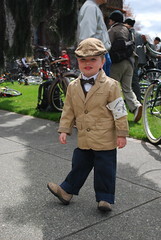 Again, just listen to the mellifluous tones of your Tweed Ride Marshals and all will come off swimmingly. 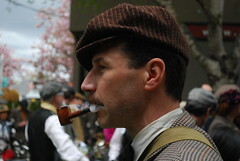 1:30 pm – Tweed Ride meets the Gorge. The Ride will wind itself through the Autumn colours along the Gorge waterway and finally come to rest in a pastoral spot where a steaming cup of tea awaits and the lawns prepare themselves to be kissed by tartan blankets and wicker hampers filled with delicacies. 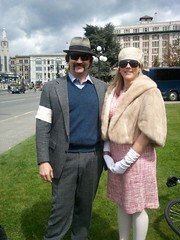 3:00 pm – Tweed Ride ends. Please take care riding home, dear friends…. 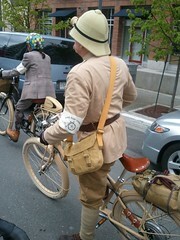 Posted on September 6, 2013 by Tweed Ride Victoria Posted in Uncategorized	. This is the first of four emails that we will send out to you each Friday until the Ride. 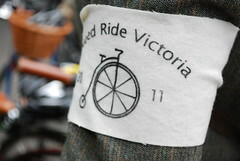 The intention of these emails is to update all riders on updates and changes to your Tweed Ride. 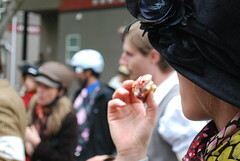 First off, please note the Latest News updates on the Tweed Ride website. These posts are added every three days or so and will provide you information on contests, offers, and news in general. The Route is shrouded in mystery, but never fear, all will be revealed in a timely manner! But note that this year’s Ride will begin at St Ann’s Academy, with check-in beginning at 11 o’clock in the morning. 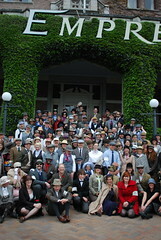 The traditional Tweed Ride Group Photograph will be taken at 11:45. We cry “Tally Ho!” and set off promptly at noon. The total riding time, with a slight pause for contest judging at the venerable W&J Wilson on Government Street, will be approximately seventy-five minutes. Something we wish to stress this year is the end of the ride, which is not a pub, but a picnic in the park – a sprawling, beautifully located picnic. It is up to you to populate that landscape with bursting hampers filled with delectables, colourful blankets (hopefully with a smart tartan! ), teacups – let your imagination be your guide! Tea will be provided, courtesy of Murchies. As in years past, we encourage everyone to bring their own teacups. To that end, Chorizo & Co. on Fort Street is offering the sale of picnic hampers made especially for the Ride. If you wish to order one for you and yours, contact the Shop prior to Wednesday, 25th of September at 250-590-6393. Please have a look at our Latest News Post for more information on this! There are still tickets for sale, so please spread the word! 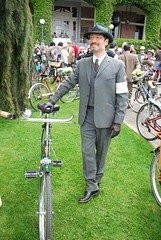 Posted on September 4, 2013 by Tweed Ride Victoria Posted in Uncategorized	. And it dawned on us that not everyone knows about the curiously compelling story of tweed. How fitting that our long time sponsor Sideshow should be offering a prize for Best Ladies Fashion Accessories, as accessories are a True Sideshow to the main stage that is a Smashing Outfit. Having beautiful tweed attire is fine, but what makes it really great are the accessories. This is a very fun competition because of the Plethora of Options available for individual embellishments – petite ties, billowing silk scarves, comfortable tweed scarves, flashy fascinators, ripping handbags, that “just-so” set of stockings – all this and more are part of this competition! Not only is Sideshow judging this competition, but they are also Well Known in Victoria as a locus of vintage clothing, offering a discount to Discerning Tweed Riders and, as an added bonus, Sideshow’s Sam is available for Alterations and Tailoring of your ensemble.